Lost & Rewound continues to dominate my life outside of the home. We have a few shows already in the can for the next few weeks, and a handful of other great contributions waiting in the wings. With our episode count pushing ever so steadily towards 70, it's clearly been difficult already to keep all the episodes straight. So, instead of presenting the three most recent episodes, I've taken the time to add a few more slots in the Audio section here, and in the process opted to provide my current top 5 favorite episodes of recent memory. Shout out to Josh Ruben, Jay Miller, Joy Donze (more on her in a bit), Amber Drea, and of course Dinah Fried and Cait Chazen who I spoke about in my last entry from September. Barry Stelboum from The Occasionalists invited me to rock that jam with them last month. Upon their return to the basement of Union Hall for their next benefit event, I will once again be performing a song with them. All ticket proceeds for this evening go towards helping the ACLU as well as DRUM, a Brooklyn based immigrants rights group. Aforementioned friend and brilliant actor buddy Joy Donze's amazing one woman show is among two that are heading to the Edinburgh Fringe Festival, and so spawned this crowdfunding event at one hell of a space out in Bushwick called Tilt. Being that Joy's show, "13 & Not Pregnant," is literally taken from her middle school journal, it seemed appropriate that one of the entertainment offerings for this evening is an hour of "Journal Confessions." I'll be one of the readers for that portion, and as everyone else will be doing in some capacity, I will be dressed up like my 8th grade self. This won't be hard since my wardrobe has changed very little over the past 20 years. We had a great turn out last month. For our next slated edition of VHS Presents, I'll be one of the official storytellers/presenters! Our topic for the month appears to be "Plays & Recitals." Consider this one a shoe-in for me, as those types of videos are pretty much the only ones I seem to keep around. Michael Serpe and his improv team Ghosted have The Agency slated to perform for the March edition of their monthly residency. Fun fact, it will be The Agency's first show with the whole line-up since, *gulp*, last May? I'm so excited to get back on stage here! Looking forward to April, The Agency is currently scheduled to open for Premiere! The Musical at The Magnet Theater on Friday 4/21, 11pm. Still have to upload more of the several headshots I shortlisted from last summer, but I did update the Photos section a tiny bit while I work on collecting more for the site. More updates to come soon! Thanks for checking back in here. Well, I did it again. I totally left this section without any updates. Truth be told though, it was a pretty dry summer, literally and figuratively, with little to no gigs save for my weekly grind with Lost & Rewound. I have spent week after week producing, editing, and mixing these shows all on my own. Late nights have been spent in the guest room upstairs with the A/C blasting, while I stay up 'til ridiculous hours and/or get up extra early to polish these shows to perfection. So L&R's been keeping me SUPER busy. Luckily, as the summer winds down, all other activities seem to be winding back up. For one, half of the Agency performed the first show in three months out in PA just recently! The Pittsburgh Comedy Festival appearance was apparently a huge success, so much that the group is being asked to come back again next summer! Congrats to us! Joe was unable to make it on account of his new dad status, Heather was deep in rehearsals for a show, and I? Well, I'll let the photo below tell the story. It was sweltering out that day, but somehow I found myself beaming more from the happiness than from the heat. Congrats to Sean & Tricia! Speaking of professional photography, I'm on the last stages of selecting photos from the session I had with Alex Schaefer. Very belated, most definitely. Out of a few hundred though, I am now more or less down to 30 shots with about half of which I'm planning on putting up here on the website anyway. While I keep you waiting, try and enjoy the excruciatingly detailed composition of this Heebish face in the meantime. Alex, you killed it. On the on-camera tip: My scene from "Love Bites" has been added to my Vimeo channel. Check it! I really liked the way it came out. Thanks again to Hunter Zimny outta Purchase College. Also: it looks like the comedy short I did for Dov Torbin several months back will be seeing the light of day shortly. I don't want to give too much away (not like I don't alredy tread enough water as it is), but here are a few images. Tony Wolf rockin' a simply magical Ditka 'stache. Finally, let's talk about VHS Presents. I'm on the line-up again THIS SATURDAY! The FB event link is here. Asher Novek will also be there, as will the usual suspects of our team minus Nisse: Mark and David are presenting as well, while Angel and Caitlin will be hosting. 7pm at Videology, free admission, and delicious nachos. Stalk me, dammit. Or at least let me know you visited my page? Thanks for reading. Yesterday I had the opportunity to work with photographer Alex Schaefer! We had worked previously together on a Sight & Sound project through NYU when he was in undergrad; you can find "Emilie" on my Vimeo channel. Since graduating, Alex has focused his passions from film to headshot and portrait photography, and the results are stunning. It turns out he's photographed quite a number of people I've crossed paths with in the past, including improviser Doug Widdick (North Coast, primarily), and comic Calvin Cole (Co-host of Cheap Date, among other things). I was so excited to have him photograph me, that I thought I'd even bring along a stylist because let's face it, if you've ever met me you'll know that this hair needs serious taming. Enter Brittany Holmes, who fixed up my hair on Friday ahead of the Monday shoot. Obviously I don't have anything to show you now, but you'll definitely see them in the photo section on here very soon! In the meantime, here's us three being silly. The VHS presents showcase for StoryFest was last night, and we had a ton of fun! Decent turnout too. It was so great to finally be back on stage after nearly two months off. Here are a few snippets organizer Harmon got of us. Thanks, Harmon! Another group photo for good measure! Photoshopped by Caitlin for the school newspaper. We're on hiatus at the current moment! Between a lot of us (myself included) travelling last and this month, no one has been available to even meet for practice! We hope to pick right back up in August. Stay tuned! This has easily been taking up all of my extra time, since I've been editing, recording, and producing it all on my own. My show partner Jimmy been fantastic, and has been instrumental at giving the show the mood I truly was looking for: scrappy, with a simple back and forth banter that has been nothing short of consistent these past two months. I've been making sure to keep the three most recent episodes up to date on the L&R section here on my site; right now, the current episode roll reflects this. For all other updates, follow L&R on the main Tumblr site where you'll get a new update every Tuesday. Don't forget, if you or anyone you know have any audio cassette tapes you wish to dust off and chat about, reach out to us ASAP at lostandrewound@gmail.com! Our next show at Videology is coming up on Saturday the 23rd, FB event link here. I won't be presenting anything at that show specifically, though I will be there helping out. I WILL however be apart of Story Fest, happening this upcoming weekend! Caitlin, Nisse, David, and I will all be taking part for the VHS Presents: Best Of showcase happening this Saturday at 6:30pm at The PIT Loft. Check it out! In other news...I hope to soon have a few on-camera projects available for public viewership on both Vimeo and YouTube, including the one I shared on last update. Still awaiting the final cuts and looking forward to seeing how they turned out. Also! I have a session with photographer Alex Schaefer next week, so be on the lookout for some very pretty photos coming at ya in the weeks to follow. That's about it for now. A BIG shout-out to my air guitar sensei Marquina aka Mother FeathAir for making it to the National Championships in Austin! So excited for her. Just caught a glimpse of a student film I worked on through SUNY Purchase--- my first time working with students from there. The production went so smoothly this past winter. The entire cast and crew provided such a relaxing atmosphere, which was very much appreciated. The film was called "Brief Glimpses at Strangers," and I filmed a vignette for it, the last of three separate ones. Here is a still from the final scene. The Agency had a fantastic time at Tamara & Evelyn's Tarot Show this past Friday! Jessica Ann presented a wonderful confessional, Steve Ling did some two-person improv with Tamara, and we did a 15 minute musical based on the card "Queen of Air." Check out Heather and me dancing more or less in sync. I need a new headband. Fresh off the presses, VHS Presents now has its own official FB page! Just in time before our upcoming event this Saturday at Videology, hosted by Angel and Mark. I'll be there snapping photos again. Our first episode of Lost & Rewound has been shipped out, and will be ready for play at new home base Radio Free Brooklyn tomorrow afternoon, Thursday the 19th, at 3pm EST! Check the Lost & Rewound website for more details. I sense you may end up waiting until the archived episode is made available. Anyway, I'm really quite pleased with the quality of sound, and having Jimmy back in the mix made the recording session last week all the more fun and comfortable. The Agency is indeed having another show and it's THIS FRIDAY! Two rad chicks named Tamara and Evelyn are hosting a night of improv and comedy that happens to also include tarot readings before the festivities get underway. 7:30 pm at The PIT Loft, FB event here. It's been a while since our last show so if you want to see just what the hell our group is all about, come and hang out with us for an hour whydontcha. Check out these CRAAAZZZZY good photos of yours truly, taken by the fantastic Alix Piorun, at the U.S. Air Guitar Championships from a few Sundays back. Deep in concentration as I absorb the Dio. Last night, in front of about 50+ people for the U.S. Air Guitar Championships at Saint Vitus in Greenpoint, I debuted my Danzig-inspired Air Guitar alter ego, The Danziger. Below is the video, which I just uploaded to my YouTube channel/playlist. I barely made it to the second round and I honestly could not believe I had accomplished this. I would have been content for having just competed but I was actually moving on? Crazy! The second round performance was not recorded (at least not that I know of), and I had the rather daunting task of being given a song I never heard before. The rules went like this: since I came into the second round in fifth place, I was to get a song I did not know and I would have one chance to hear it, and then I would have to perform an air guitar set the second time around. All following competitors in the higher slots had the option to pick the songs before them, or pick another song from out of a hat. I didn't have that option, so I was stuck with a sampling of Dio, a fine choice seeing as all the night's proceeds went to the late legend's Stand Up And Shout Cancer Fund. I didn't know the song I was airing in all fairness. But I held my own, and by the end of the night, I somehow managed to finish in 4th place. Out of nine competitors? I consider that an accomplishment, why not? My confidence had been given a boost over the course of the night's proceedings since my parents had been there to root me on. They had a great time, and actually were not the only set of parents there if you could believe it! I also had the privilege of performing/competing alongside my pal Nithya, who I used to work with at The Kings of Karaoke. In fact, there were other TKOK folks who took part: the host Tom aka Smo (who lent me that awesome belt) and Cassie who was one of the judges (Comic Alison Leiby and Mutoid Man/Cave In Guitarist Stephen Brodzky rounded out the trio). Here's all four of us karaokers in Air Guitarb (c what i did there?). Finally, I'd be remiss if I didn't give one more shout out to my MVPs in this. - My pal Lindsay who did my make-up right before, conveniently close by so I didn't have to worry about scaring too many people in my path. She also managed to rock it out in about 30 minutes, effortlessly and with grace under pressure. - My sensei and overall Air Guitar muse, Marquina (aka Mother FeathAir this go around), for teaching me the way of the Air and for enlisting me to try something new and crazy. She is going to be competing in Boston already come July, as she previously qualified in Staten Island. I wish her massive amounts of luck in what I'm sure will be an even wilder competition. In the meantime, The Danziger will be back at some point, if not by next year around this time to shred once more. The Danziger & Mother FeathAir. Hell of an update for you. I saw Air Guitar Nation 10 years ago when I worked for the Tribeca Film Festival. I vividly recall the main protagonists, C-Bo and Bjorn Turoque and the journey they both took to the World Air Guitar Championships in Finland. Fast forward to now, and my friend Marquina (aka Marteeka or PWN Jett) is a pretty big deal, for real, in the Air Guitar community. I received a message from her on FB about a month ago seeing if I would be down to compete in the U.S. Air Guitar Championships. It didn't take a lot of convincing for me to give an emphatic YES! Though in the recesses of my active back of the mind, I couldn't help but feel like "Me though?" I had never been to an Air Guitar event, though I do know of a handful of folks overall who have competed in years past. Now I'm attending AND competing for the first time, this Sunday in Greenpoint, BK at 8pm at the legendary metal haven Saint Vitus, in what will be an unequivocally absurd event. I can honestly say if you attend you will not be disappointed with your decision and hey, I could use the support. Oh my goodness, I totally have been meaning to update sooner! For those who wish to see some pics and vids from The Agency's show at The PIT Underground, you may see them all here. What else? I got to photograph this past weekend's VHS Presents show at Videology. Will post a link when the album is created. I also updated the Lost & Rewound Soundcloud and Tumblr sites. Thanks to my awesome website designer Christina Roman for helping me out with a slick new logo! Nothing much else to report at the moment, except that if you are seeing this, it's because I have officially starting pimping this website out on numerous forms of social media. :) Thanks for visiting! Take a listen to my appearance on Empty Orchestra! I'm totally singing some songs, schooling about karaoke tricks and techniques, and stammering the whole damn way through. Chalk it up to nerves being in such an awesome studio, one with a soundboard of which I look forward to being on the other side very soon. 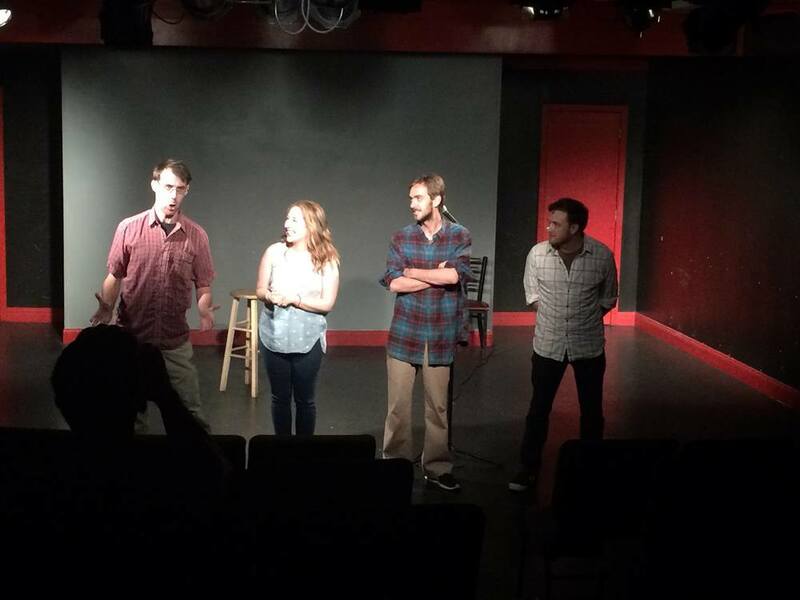 Tomorrow night at 10:30pm, The Agency is hosting an hour long improv show at The PIT Underground! $10 admission gets you in to see us, alongside improv sets by two other groups, Heiress and Picture Day! RSVP or get the general skinny at the FB event link here. Remember that huge update I promised you about Lost & Rewound? Here it is, in full Elannesque glory. To summarize though: Lost & Rewound as a podcast is ending, and is instead becoming a legit online radio show through Radio Free Brooklyn. Founding member Jimmy Hoffman will be back in the fold assisting me with hosting duties as we embark on the next journey. Effectively, Season 3 of Lost & Rewound shall begin alongside the start of Radio Free Brooklyn's official third season. What are the odds? And holy crap, I have a lot of work to do for the next month! Stay tuned! On Saturday, The Agency performed a solid 15 minute set in the second half of Rufus Khan's engaging monthly show at The Player's Theatre! There were only four of us, as Joe was not available and Heather was fighting off sickness. We rose to the occasion with Frank Spitznagel on the keys. Sadly, no photos were taken during the performance (the suggestion was "airport lounge"), but we did get a post-show 60's album cover out of the deal so that was something. The walkie-talkie is my weapon of choice. One more quick plug! The Agency now has an official website as well as a FB page! Both are freshly painted with the training wheels still on, but poke around on the website and you'll even be treated to some video uploaded with kindness by Jillian. Got a busy weekend ahead! I'll be performing with The Agency again this Saturday, this time doing a late show at The Player's Theatre! 10 pm, $5, 115 MacDougal St. FB event here. Then, this Sunday, I'm being interviewed on the Internet! A lot of you may know me for being a rather enthusiastic karaoke performer (as some of my earlier YouTube uploads would have you believe). I've been asked to reflect on my experiences on Empty Orchestra, streaming LIVE! from 3-4pm on Radio Free Brooklyn. I may even sing a few songs. How well I sing will depend on the songs selected. What a thrill. HUGE news regarding that darling little scamp of a podcast I created called Lost & Rewound. I have to remain quiet about it now. An update will be going up on the L&R Tumblr and supplemental social media sites within the week. Our team member and all around awesome funny lady Caitlin Brodnick was on photo duty last night and snapped this pic of me in the beginning of my set at VHS Presents. Living proof that some shirts do in fact have a shelf life of 20 years even after continued wearing without the tearing. Time to work on that posture thing. Thanks to everyone who joined us as we shared some rather hilarious videos. Angel and Nisse will be back next month on April 23rd! Here's a cute photo of all of us presenters from earlier tonight. With the quickness it is shared! Tomorrow night I'm hosting with David Lawson at Videology for VHS Presents: Breaking The Rules, beginning at 7:30 and free to the public! Featuring Mark Pagan, Anita Flores, and Simi Toledano. Come on down! Crazy yet intimate show last night at Broadway Comedy Club led to this photo being taken in all of its dark glory. The sound and lighting were not working due to a flooding issue at the club! But the show went on, and we made due with the lack of lights just fine. The God aka Frank Spitznagel backed us up! Heather, we missed you. Broadway Comedy Club, we're coming back for ya. The team known as Junifer is headlining a small show there Tuesday the 22nd at 6pm, featuring stand up from Mindy Raf, improv duo The Lottery, and yup, THE AGENCY! Public event on FB is here. Dudes and dudettes, we've got ANITA FLORES and SIMI TALEDANO in the house for VHS Presents on March 26th!! This lady power will undoubtedly bring our show the goods it already is getting with myself and David Lawson hosting. To top it all off, fellow VHS Presents team member Mark Pagan is also on the line-up. Sadness that both Angel and Nisse will be out, so we got one heck of a show for you to make up for such a double whammy absence. Here is the public FB event for which you should RSVP ASAP OK THX BYEE. Howdy folks! The Agency has another performance coming up tomorrow night, this time at the Broadway Comedy Club. Improv team Hey Jane is hosting and we're gonna be playing alongside another team, Drunk Orphan. The possibilities of weird are endless. We even have Stoddard Backall backing us up on the ivories for this go-around! We go on at the jump, 6pm. Last night, not only did I make up a song from scratch with my musical improv team, but I also went and worked sound for VHS Presents, the Tank produced storytelling/old video presentation event that goes on every month at Videology in Williamsburg. Though I did not present myself last night, I will be doing so AND co-hosting to boot on SATURDAY MARCH 26TH. Line-up to follow, but add to your calendar for the time being! It's free! Check out the photos that I took, shared courtesy of VHS Presents co-creator Angel Yau. Tonight I made my official musical improv debut at The Magnet Theater with my indie group The Agency! Quite an intense experience. Below are some iPhone snapshots our friend Melissa Welch took of the show, as well as a group shot that team captain Jillian Vitko has up on Instagram. Our suggestion was "Bouncy Castle." Playing the neighborhood war veterans. Because there is so much going on with my projects right now, be sure to check here for all updates as they happen. Assuming that you're not already getting numerous updates from me on your Facebook feed, consider this the HQ for all things Elann. Thanks for visiting!